Our church is for everyone and you are always welcome to visit - the building is open every day. You can admire our fine medieval features, sit quietly for a while or take time to pray a quiet prayer. Our main service each Sunday is at 10am. It is a Sung Eucharist (Holy Communion). As a congregation we do our best to be warm and friendly and welcoming to all, so there is no need to be anxious about coming through the door for the first time. 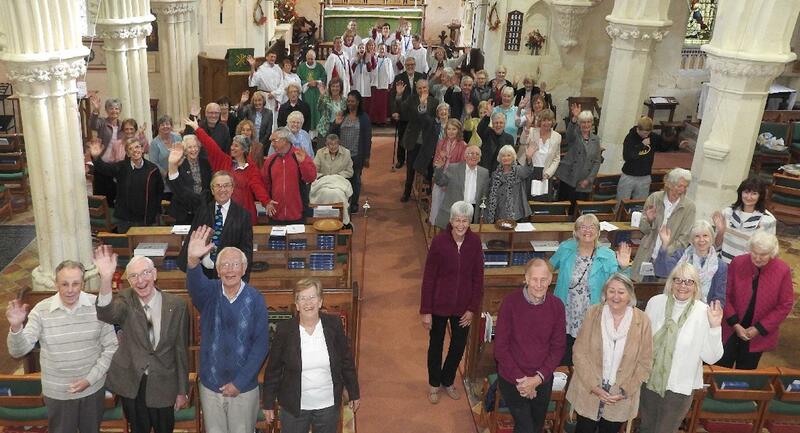 At this service you will find a good size congregation which has been slowly growing in recent years. We have a strong choral tradition and an excellent choir, organ and musical director and although we are a fairly traditional church, we know the importance of being outward looking and open to new ideas. On the third Sunday of the month there is a less formal, non-communion service. Families are always welcome. There is a corner equipped with books and toys where parents or carers can, if they wish, sit with young children but remain included in worship. We are continually improving the building and its facilities: we have comfortable, padded chairs and recently added a wheelchair accessible toilet extension with baby changing facilities. Soon we hope to improve the kitchen area to make it easier to serve refreshments after services, at our monthly coffee morning, Messy Church and Ladies Guild, as well as at many other events held in church. During the year there is a full program of entertainment and social events including Carnival, Open Gardens, Christmas Fayre, Music at St Mary's, Sunday Lunches, Men's Breakfast Club and Ladies' Guild both with interesting speakers. There is also a monthly House Group, open to all, a friendly and supportive Prayer & Praise group, a fortnightly group for parents/carers and young children called TOTs and Messy Church, held at different times during the year. We invite you to pay us a visit and find out more. St Mary the Virgin, is in the parish of Eaton Bray with Edlesborough (which comprises Eaton Bray, Edlesborough, Dagnall, Northall and Wellhead) in the Deanery of Dunstable, part of the St Albans Archdeaconry, which in turn is part of the St Albans diocese. The parish boundaries are spread across two counties. Whilst Eaton Bray is part of the District of Central Bedfordshire, Edlesborough is in the Aylesbury Vale District of Buckinghamshire. Whilst the Parish Church for the whole parish is St Mary's in Eaton Bray there is another church in Dagnall, where Anglicans and Methodists work closely together in the same building which is part of the old parish of Edlesborough. None of these administrative complexities worry our parishioners, at Eaton Bray and at Dagnall a warm welcome is always given! The two parishes were united (and Edlesborough transferred from the Diocese of Oxford) in 1974, when the Church of St Mary the Virgin, Edlesborough, was closed for public worship. This historic church, on its dramatic hill-top setting, is now in the care of the Churches Conservation Trust, and occasional services such as Evensong, the Church on the Hill festival, and one of the three Carol services are held there. You can find more about our worship, ministry and outreach on this website. The Church is early 13c. and has carved Early English stone arches and font, elaborate 13c. Ironwork on the south door and Bray family brass. There are also many other interesting architectural and historic features. It is described as one on the finest Parish Churches in the country. For more information, please see the Virtual Tour created especially for this website. please contact Eileen on [email protected]. St Mary's Church is a member of North Chilterns Group of Parishes (NCG). For more information about the NCG, please see the North Chilterns Group page. There are a number of pages with information about holding special services at St Mary's Eaton Bray; Baptism, Confirmation, Weddings, Funerals. For more information on the various church groups, please see the Church Groups page. We currently link to a number of external websites that may be of interest to you. These links can be found on the External Links page.